The Justice Health & Forensic Mental Health Network (JH&FMHN) introduced the first Hepatitis C virus (HCV) elimination program in the NSW correctional setting. To introduce an elimination program for correctional patients with HCV , using new direct acting antiviral (DAA) medications. Cures patients with HCV in the correctional setting. Reduces costs associated with managing HCV symptoms. Returns patients healthier to their families and communities. Provides a safer workplace environment for correctional staff. Incorporates population health services in a drug and alcohol setting. Meets the HCV treatment targets outlined in Ministry of Health service agreements. HCV is 20-30 times more prevalent in NSW prisons than the general community. Historically, HCV treatment was not widely available in prisons, due to the side effects of older medications and limited patient uptake. The inability to provide needle and syringe programs also presented a challenge in the prison setting. In March 2016, new DAA medications became available on the Pharmaceutical Benefits Scheme (PBS). These medications had a well-tolerated regime and minimal side effects, providing an opportunity to potentially eliminate the entire HCV pool in the prison setting. JH&FMHN introduced the new HCV medication in one of its prisons - the Compulsory Drug Treatment Program (CDTP). Screening of all patients, including new admissions, was undertaken on a regular basis, with concurrent treatment undertaken for those with HCV . Harm minimisation education was also provided to patients, to reduce the risk of re-infection in the community. This approach to eliminate and control the entire virus pool was viewed as an innovative measure in the custodial setting. With minimal patient movement and a stable length of stay, the CDTP was an ideal pilot site for this trial. The program presents an opportunity to scale treatment across all prison settings in Australia and internationally. March 2016: DAA medications listed on PBS ; initial discussions held between population health, drug and alcohol, Hepatitis NSW and consumers. April 2016: Formal consultation held at service director level between population health and drug and alcohol. May 2016: Initial patient work-up began to identify HCV prevalence. June-July 2016: Prevalence determined; specialist transitional nurse practitioner and clinical nurse consultant assessment undertaken including FibroScan; consultation undertaken between population health and pharmacy to plan for expected amount of medication prescribed. July 2016: Medication prescribed and dispensed; patients started treatment. 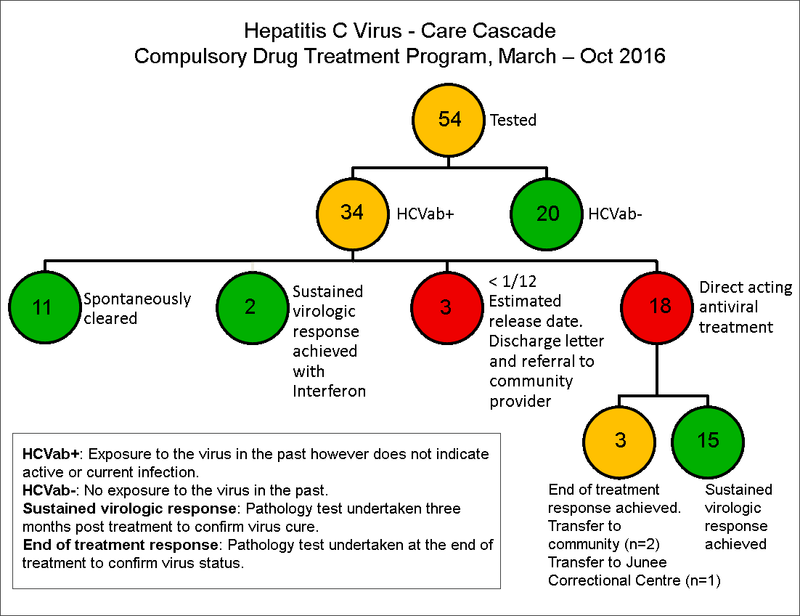 October 2016: Patients completed treatment and HCV cleared from the CDTP . October-December 2016: Evaluation undertaken including planning for replication and scalability. In July 2016, all patients in the CDTP were reviewed for HCV risk factors (58) and those with risk factors were screened (54). In this group, 18 patients had chronic HCV and were concurrently scheduled for treatment. Within three months, all patients (100 per cent) achieved end of treatment response and 15 patients (83 per cent) achieved sustained virologic response after three months, which is considered cured by the scientific community. Three patients (17 per cent) were released prior to assessment. Of the 18 patients who began HCV treatment, four patients were Aboriginal and provided with culturally appropriate support. During and following treatment, patients reported improved physical and mental health, including increased energy levels, better physiological wellbeing and a more optimistic outlook on the future. Long-term benefits included significantly reducing the risk of further liver scarring, which can lead to cirrhosis, hepatocellular carcinoma and death. Since HCV was eliminated in the facility, no new infections or reinfections have been identified. JH&FMHN has begun to identify similar-sized centres in the NSW custodial and forensic mental health network and will work with relevant stakeholders to replicate the model and increase scalability as funding becomes available. Thorough planning, consultation and appropriate buy-in at all levels was vital to the success of the project. The time taken to follow up results should not be underestimated. Incidental findings can be significant, such as identification of other blood-borne viruses and sexually transmissible infections unrelated to HCV , which may not have been picked up otherwise, demonstrating the importance of broad screening. Implementation of an easy-to-use checklist to ensure nothing is missed has helped with further rollout. Health promotion activities to promote buy-in from staff and patients have greatly contributed to the high success rate of broad screening and testing. Working with patients in the co-production of projects has encouraged pride, ownership and helped break down barriers, reduce stigma and discrimination. Promoting the stigma and discrimination training for staff via My Health Learning should also be considered with this project for future rollout. NSW Government. NSW Hepatitis C Strategy 2014-2020. North Sydney; NSW Health; 2014. Justice Health & Forensic Mental Health Network. Service Agreement 2016-17. Malabar NSW; JH&FMHN; 2016. Justice Health & Forensic Mental Health Network. Strategic Plan 2013-2017. Malabar NSW; JH&FMHN; 2013. NSW Government. NSW 2021: A Plan To Make NSW Number One. Sydney NSW: Information and Privacy Commission NSW; 2011.